We're not really sure, but it must not have been that important because it stopped in the middle of a Point Loma intersection to apparently scratch its back. 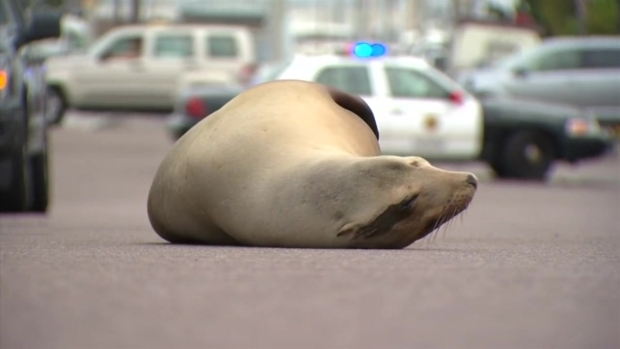 Officers were called to the intersection of Garrison and Rosecrans streets around 3:30 p.m. to find the seal lying on its back in the roadway blocking traffic. People on the street were singing Seal's "Kiss From A Rose" as a SeaWorld crew came to the sea lion's rescue. A SeaWorld San Diego crew arrived a short time later and trapped the sea lion in a net and loaded it into a cage. People on the street were heard on video singing Seal’s “Kiss From a Rose” as the scene unfolded. The sea lion was taken to SeaWorld's Animal Health and Rescue Center and given a full-body exam. She is able to eat live fish and remains "alert, active and responsive," SeaWorld said. The rescue center will monitor her for a few days, but haven't announced when she will be ready to return to the ocean.